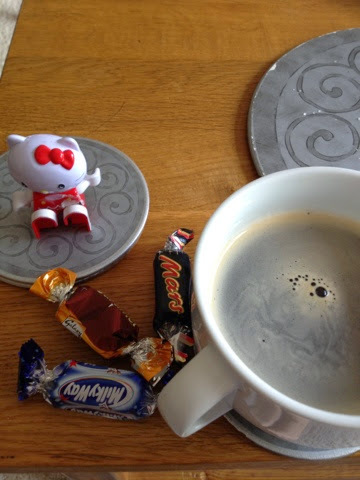 So in no particular order and joining in with Gillian, here are my happies. I’ve been loving being outside. The ABO has been on lates so I’ve been doing the school pick up (still not quite used to that) and we’ve been having an hour in the garden before tea. It’s really helped to ensure a good night’s sleep for everyone! LittleR cannot get enough of being outside. Someone just has to mention the word garden and she’s off to get her shoes. She really cannot get enough of it. We seem to have quite a few sunflower buds appearing. I thought they’d flower a lot earlier who knew they’d be perfect in September? I’m enjoying the second flurry of flowers my clematis are having. The deep red one was bought as it has the same name as LittleR (there’s also a heuchera in the garden with BigR’s name - no one is left out) and the purple one appeared in a flower pot of sweet peas my Dad gave me a few years ago. 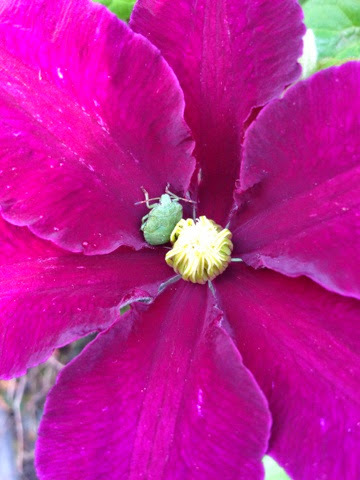 Can you see the green beetle in the purple one? I wonder if he thought he was shielded by the flower centre? 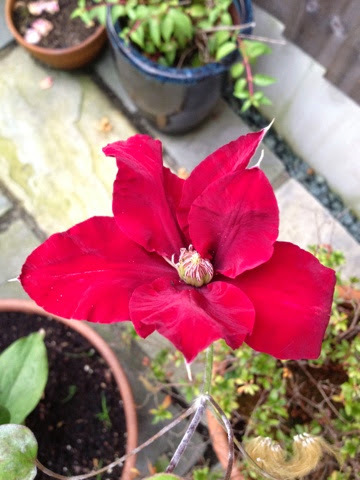 Not sure what he is or if he’s a danger to my clematis but I was struck at the colour contrast. We’ve had great success with our blueberries. I was a little bit quick off the mark and offered one to BigR about 3 weeks ago which she declared disgusting. An extra few weeks of ripening and they are delicious. 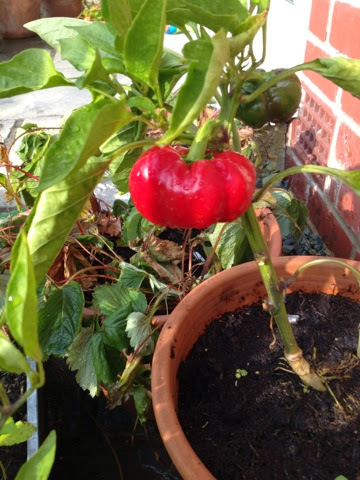 I’m also very pleased with the success of our pepper. It’s not very big but is turning a beautiful red colour. I wonder when it’ll be best to pick? BigR is loving school. She didn’t cry. I didn’t cry. I ate biscuits and wondered about the house being quiet. One thing I am amused by is the magic portal of the school bag. BigR comes home and messages are imparted via the magic portal. I am amazed by the sheer number of letters she has had already. Also, it has magical properties. She brings home a wonderful creation (or some tat – for example she may have brought home a 12 egg egg box filled with pom poms and wool cuttings and still wet pva glue) which we consider as decoration in various places in the house before LittleR grabs it and attempts to inhale the contents thereby it makes its way back into the magic portal not to be seen again. We live opposite her school. This is good for a whole number of reasons. However one downside was realised today. The ABO was sorting something in his car boot and she was outside (in a lesson) which resulted in lots of shouting ‘Hello Daddy!!’. We joked that she’d be asking where we were if the car was not on the drive when she was at school!! BigR was 5 on Monday. Five. Five. How did that happen? We all survived the party and the present opening and all the grandparents visiting before school in the afternoon. She had a fabulous time. 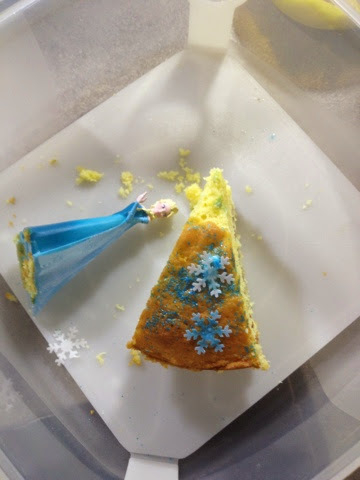 She loved her ‘Frozen’ party and her ‘Elsa cake’ (which even though I say so myself, was delicious, and yes I had the final slice!). 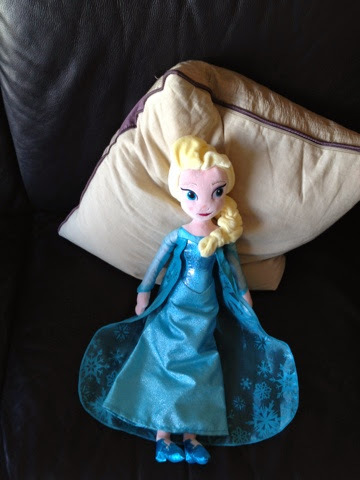 Elsa barely leaves her side now. I'm glad the Frozen party went well. 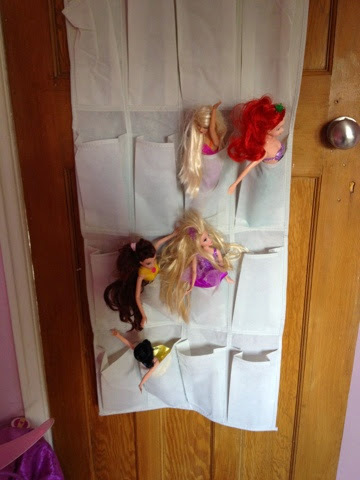 I enjoyed throwing ours too, but I'll be happy if I never have to hear "Let It Go" for the rest of my life. 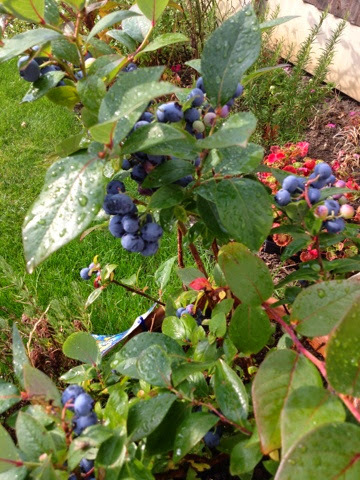 :) Your blueberries look great, did you know yours are the first I've seen growing? I just realized I didn't know what a blueberry bush looked like until now!